Two batch files available. 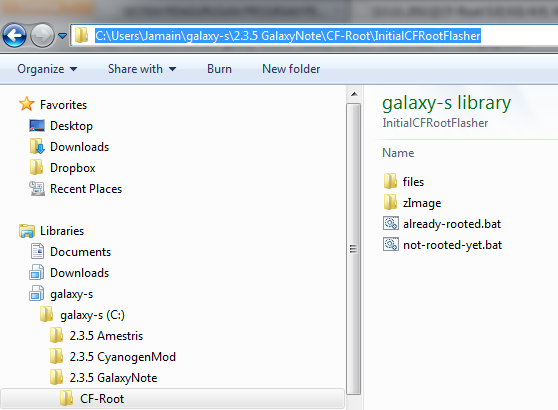 "already-rooted.bat" and "not-rooted-yet.bat". You should know your phone status. New phone from factory mean not-rooted. The folder instruction should be good enough. Extract zImage and copy to the folder. 1. Extract ZIP and TAR until you see the "zImage" file. sorry..1 noob question.if it happen i roots my phone now, is it possible to update my firmware via kies or OTA afterward? one more question. mine is 'DXKK1'. the kernel posted there is 'ZS' which is Hongkong'. Will this change my 'DXKK1' to 'ZSKK1' after i flash using that particular 'ZSKK1'? To be save DX Should not use this to root.use zergrush. owh..one more thing..is it possible for me to update my firmare via kies or OTA after i rooted my phone-using zergrush? Check with KIES. my phone is up-to-date. LA1.. How do .. I flash it if i use Odin(computer?) I put in PDA? I seem to have a normal root phone after reboot. but i notice triangle yellow warning.. what was that? Kl7 and above cant use zergrush or pc odin. All the files above need to flash via mobile odin. My N7000 is 'GINGERBREAD.DDLB2'; which one of the should use to root my phone? 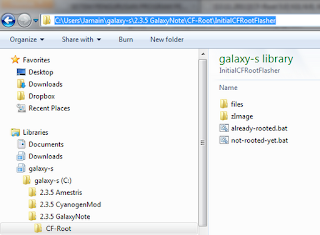 my samsung galaxy note dont start. help me. i cant start. i think power button disabled. i run rooted-yet.bat. i cant power on my galaxy note. please help me. removed battery and put it but cant power on. i think power button etc blocked by rom. is it possible? Hold the power button longer. Else try download mode (power+volume down+home) button. i longer click power button over 5 minutes. and download mode. cant power on.